Okay, this is pretty freaky. Last Sunday I preached on Matthew 25:31-46 where Jesus tells his followers that if they feed the hungry, clothe the naked and offer hospitality to the homeless, they actually have served him by doing such things. I related that to some of the things that we do at St. Andrew's particularly to the things that happen on a typical Thursday when we welcome people to a free clothing centre, when we host the Cambridge Self-Help food bank and host the community for a Supper and Social. "So, yes, I do declare it without reservation and without doubt. Jesus has been here this week. He may have stopped by at other times. In fact, I wouldn’t be entirely surprised to encounter him before I leave today – maybe in one of you. But I know for sure that he was here on Thursday. I’m pretty sure that he will stop by next Thursday too." 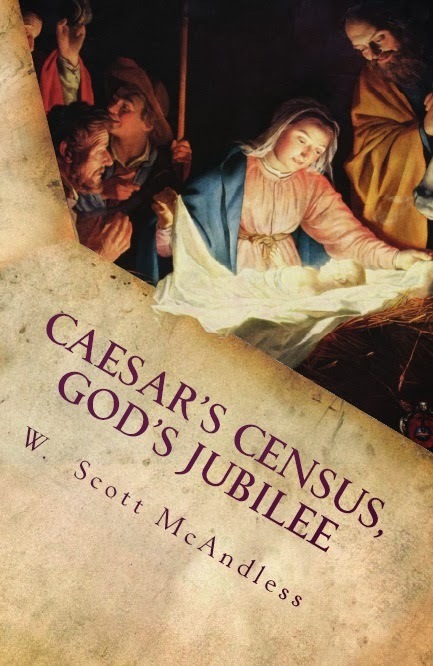 Okay, folks, I have some big news on the "Caesar's Census, God's Jubilee" front. My book continues to sell as an ebook on many retail sites but I have had far too many people asking how they can possibly obtain a printed copy that I have been persuaded to enter into an agreement to get the book printed through a print-on-demand publisher. The printed book will be available, within a day or two, athttps://tsw.createspace.com/title/4503502. It will also be sold at Amazon.com though that might take a day or two more. The list price is $9.99 US. There is one big drawback to all this: the printed book will not be available on Amazon.ca or through any retailer in Canada which means that, if purchased, it must be shipped across the border which can be complex and expensive.